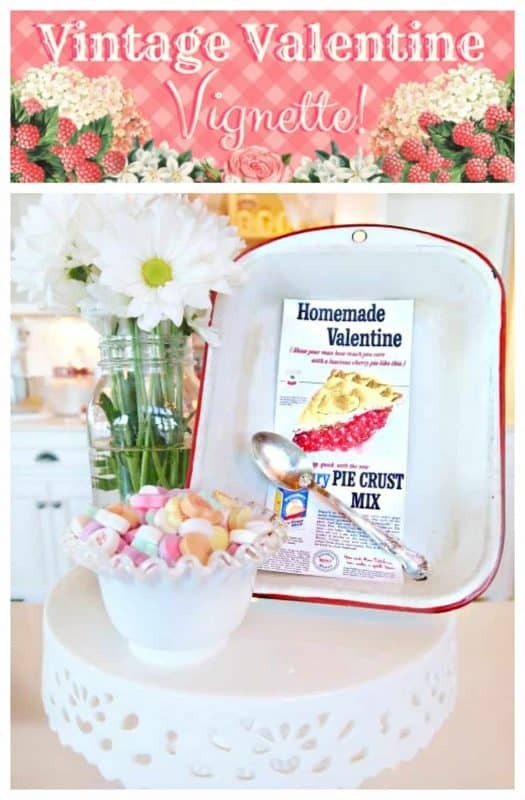 Vintage Valentine Vignette from Sugar Pie Farmhouse! Howdy-do Sweetie! 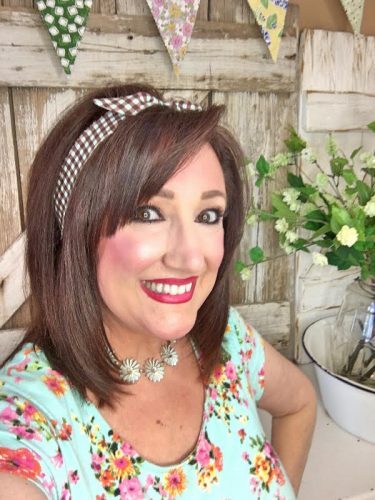 Aunt Ruthie here from Sugar Pie Farmhouse! 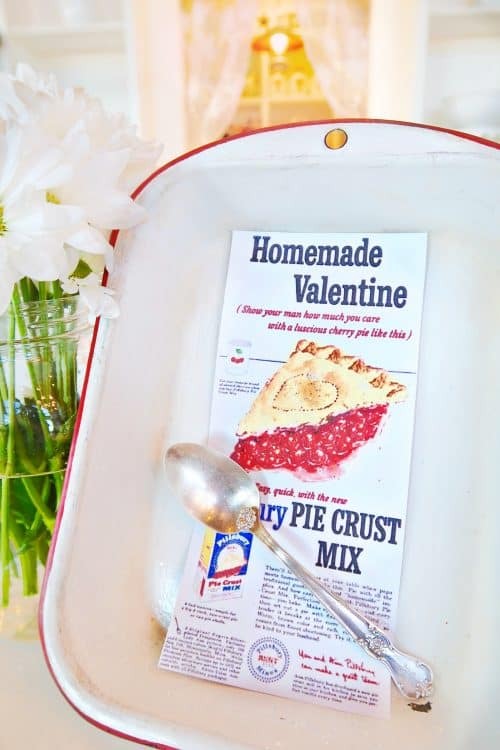 I’m excited to share with you a Vintage Valentine Vignette! 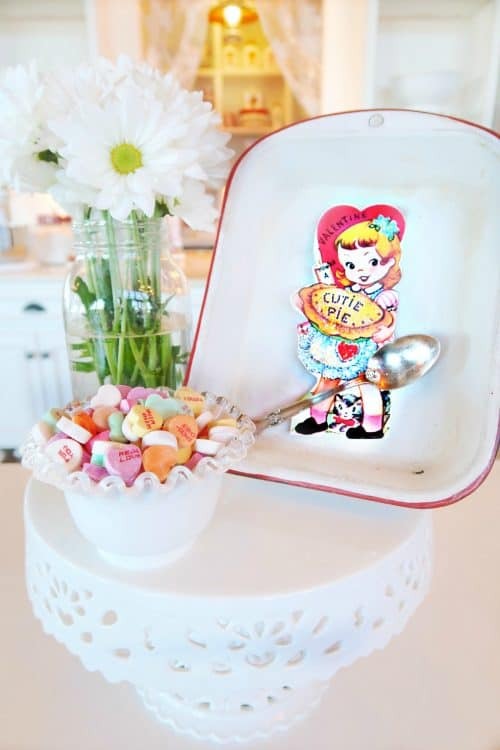 A sweet little something you can put together to brighten a little spot in your kitchen. It’s always lovely to add a touch of nostalgic charm. I found this vintage white enamel baking pan at a flea market for a couple of dollars. I love that it was well used, which in my book means well loved. From the scratches and worn areas on the pan I can only imagine the countless times it was gently placed into a hot oven, by an apron-wearin’ mama or grandma, to bake mouth-watering brownies, cobblers, coffee cakes, biscuits and casseroles, all in the name of love to bless her family as they sat eagerly around the kitchen table. You may have an old baking pan or pie pan that you can use. If not, you have a good excuse to go hunting for one at your local flea market or antique mall. Lol! I love browsing through old magazines from the 1940’s and 1950’s and was delighted to find this ad for Pillsbury Pie Crust Mix. The title was perfect, “Homemade Valentine”. So I made a copy, cut it out, added some glue and glitter to give it a little sparkle and secured it inside the pan with a magnet that I made from an old silver teaspoon. You can use any magnet of course, but I’ll show you how I made mine in this post. 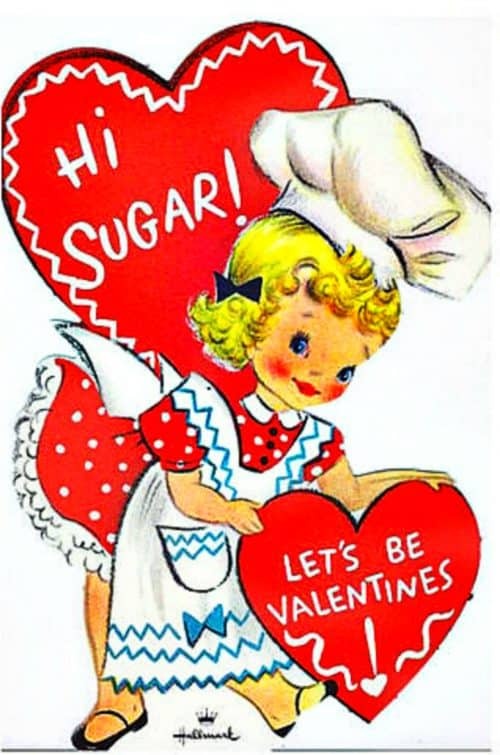 I’m also going to give you some printables of vintage valentines for you to use. 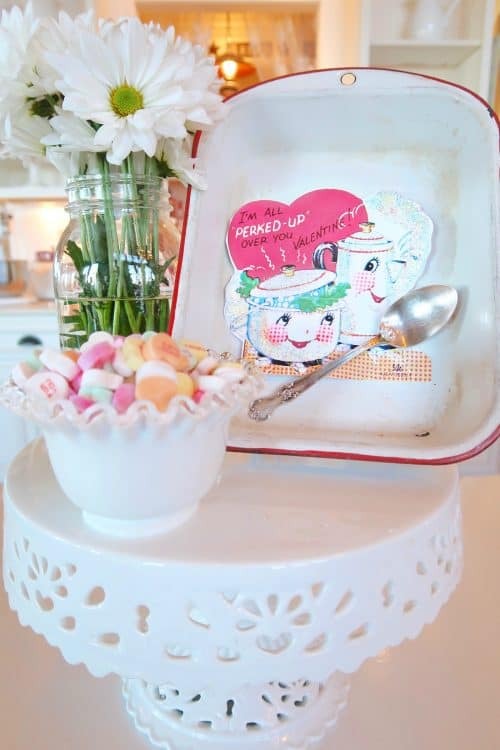 But first, let me show you how I put this Vintage Valentine Vignette together! 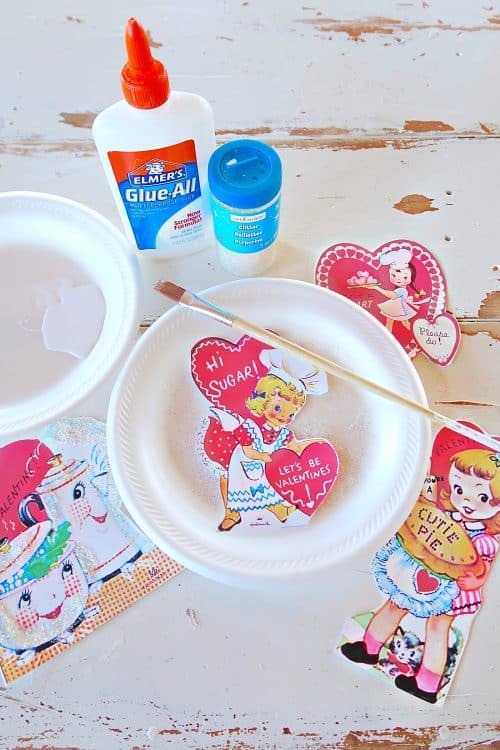 Gather together some glue, a paintbrush, glitter, 2 paper plates and a vintage valentine. Pour some glue on one of the paper plates. 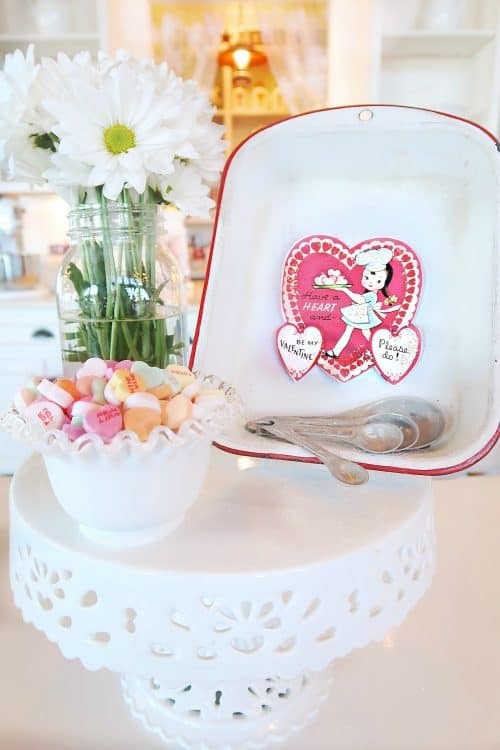 On the other plate, place the valentine on it, and paint glue on the areas that you’d like to add a little sparkle. Then sprinkle some iridescent glitter over the glue and shake off the extra. The plate will collect the excess glitter so you can reuse it again. 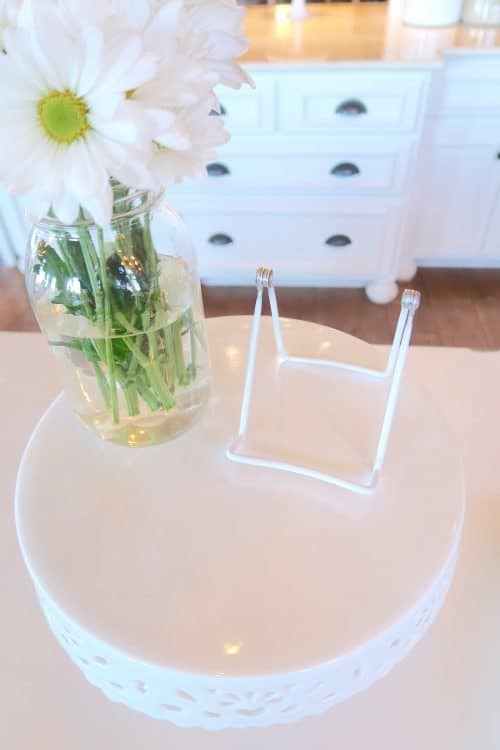 I set my little vignette on a cake stand. On top of it I placed a mason jar with filled with fresh daisies from the grocery store. I purchased this little easel from Michaels Craft Store for a few dollars which will hold the pan upright. 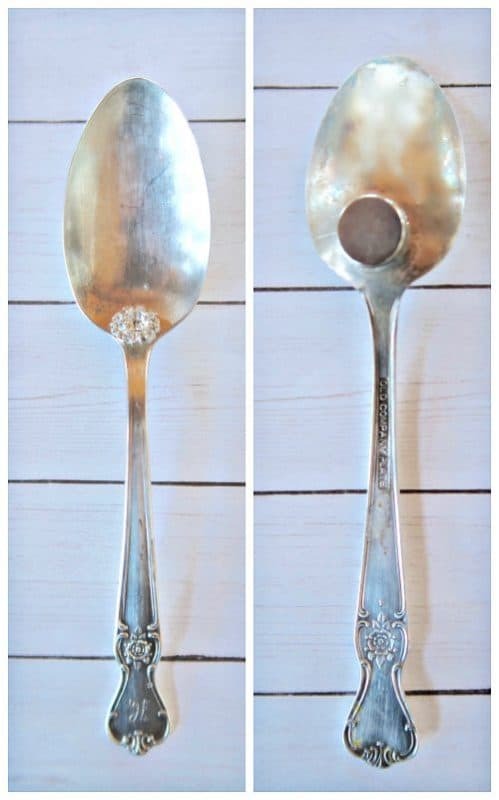 My silver teaspoon magnet, (a two dollar purchase at a flea market) is super easy to make. I glued a little rhinestone bling on the front and a small magnet on the back. The glue I used is E-6000, it’s the best for a permanent hold. That’s how you make it! So easy, yet so cute! You can find the glue at Michaels, Walmart, Target and Amazon. I bought a set of flat round magnets at Michaels. Note from Christy : this glue is the best! I use it for so many things! 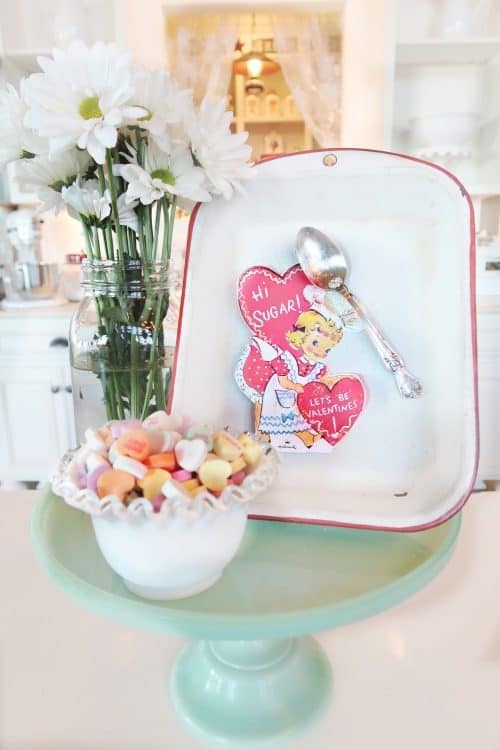 I decided to add a little milk-glass bowl of those old-timey candy hearts with little love notes on them for a little extra sweetness! If you don’t have a magnet you can just tape the valentine to the pan. Adding a set of measuring spoons looks kinda cute too! 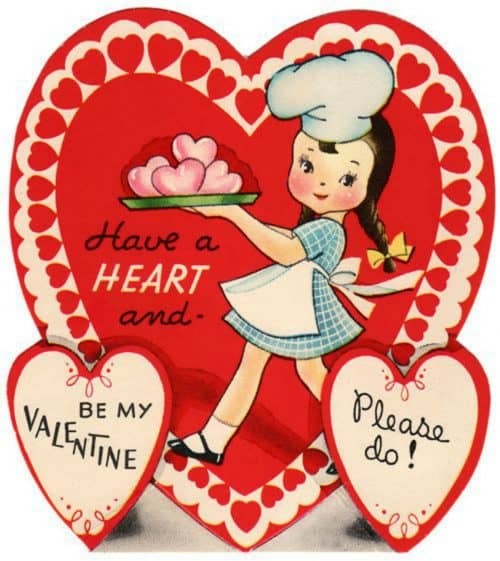 Which vintage valentine is your favorite? Awesome. Will give it a try. This is so cute. Thanks for the printabels. i love vintage Valentines Day cards. Thanks to both Aunt Ruthie for her vintage vignette and to you Christy! Your Greek Chicken recipe is the bomb! I make it at least once a month, and it’s on the rotation for next week! I love the teaspoon magnet idea too. Easy enough for even me, the non-crafter. 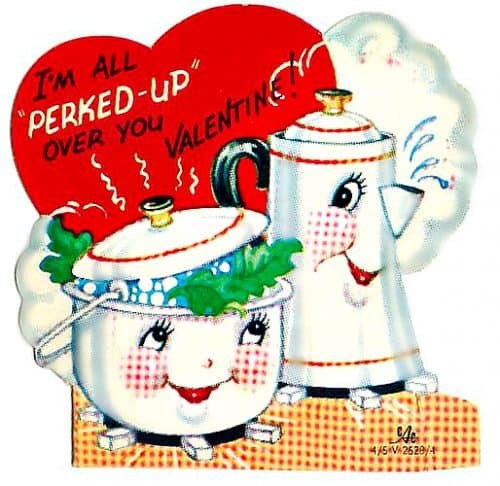 Because I’m such a coffe lover and love enamel coffee pots, my favorite Valentine is “I’m all perked up over you.” Makes me think of a cozy kitchen with a good pot of coffee on the stove. All of the valentines are too cute, but this one really caught my eye. You are so talented in bringing objects together to tell a story and promoting a smile and feeling of happiness. Keep doing what you do so well. This is so cute! Thank you for the printables. On a side note, I just ordered your latest book. I find myself pinning and saving so many of your recipes I figured I needed the book! Tbank you for all you do. 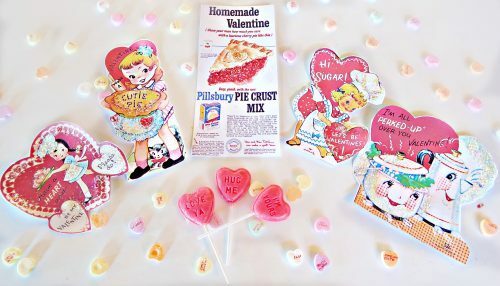 These Valentine’s and your idea is adorable!! Your vignette is so cute. I think I have an enamel pie plat trimmed in red somewhere. It belonged to my mom. Those “vintage” valentines brought back a lot of memories. I guess I’m vintage, because I actually remember those..haha! This so adorable! Very cute Valentine idea! Thank you, Aunt Ruthie. Happy Valentine’s Day to you and your loved ones. Absolutely adorable! I have the same enamel pan that belonged to my MIL, she used it to make her biscuits and pastry dough! Thanks for sharing. How sweet! 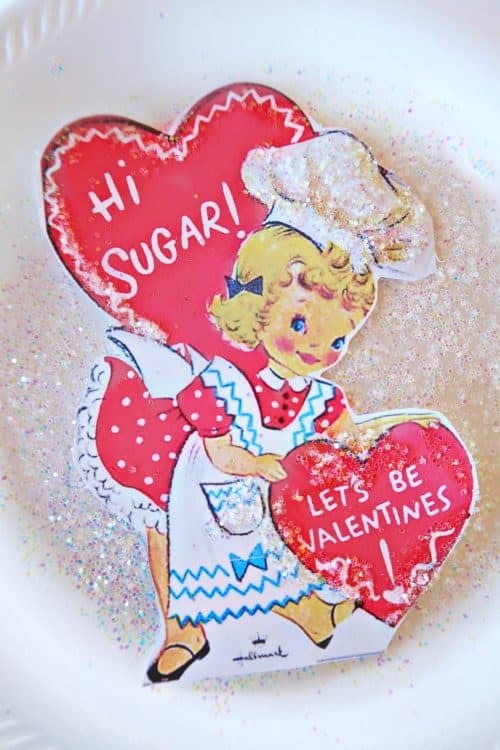 “Hi, Sugar” is my favorite valentine. Thanks so much for these lovely ideas & printables! They are all beautiful but my fav is for sure the “All Perked Up” one! So very vintage-y! I do love the cherry pie advertisement as well, but the small print on it is very blurry and doesn’t print out very well at all. Is there a way you could change that? In your vignette the writing appears more clear. Cant wait to use “I’m All Perked Up Over You” Valentine cutout. Thanks so much “Aunt Ruthie”. Happy Valentine’s Day to you and Gary.